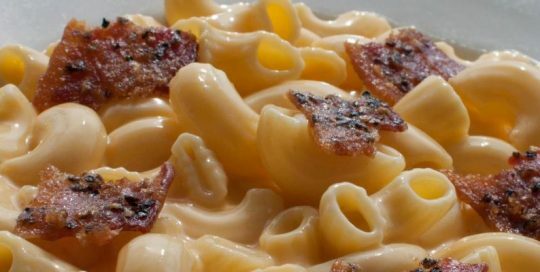 Served with 2 side items (Except Pastas). 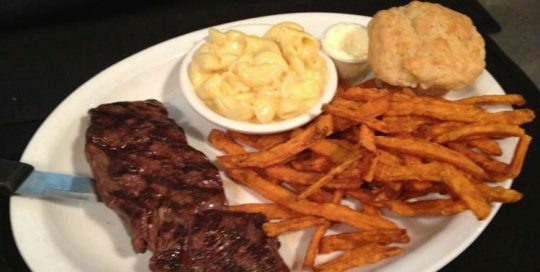 All Entrees are served with a Honey Blonde Beer Muffin & Maple Butter. 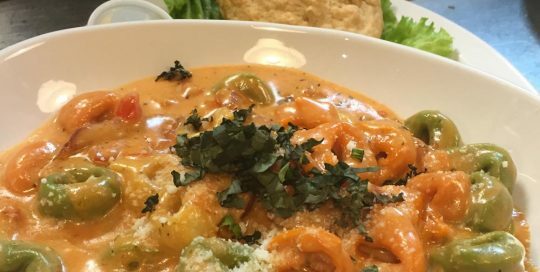 Three cheese tortellini, andouille sausage, red onions, garlic, tomatoes and crushed red pepper tossed in a house-infused Honey Pepper Baco™n vodka sauce. Finished with fresh basil and Parmesan cheese. 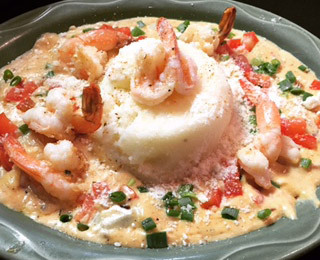 Jumbo shrimp and andouille sausage in a Bayou cream sauce with tomatoes, green onions and jalapenos. Served over homemade grits. 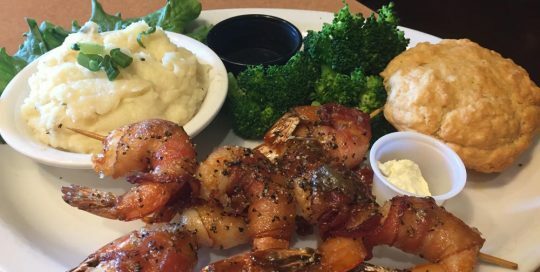 Two Honey Pepper Bacon™ shrimp skewers served with garlic butter. 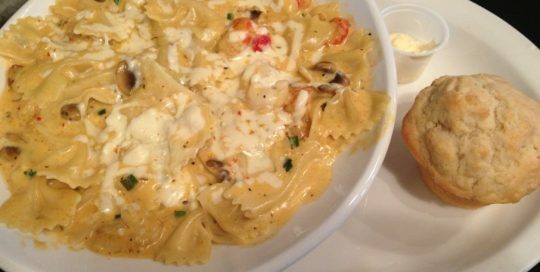 Bowtie noodles tossed with shrimp, crawfish, mushrooms, garlic, green onions, alfredo sauce, and topped with pepper jack cheese. 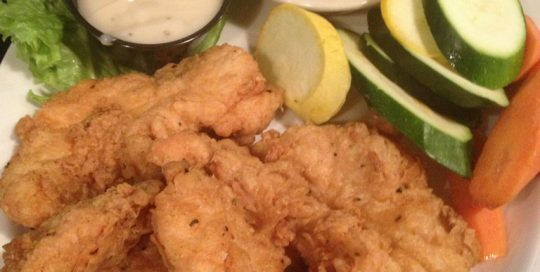 Crispy fried chicken tenders with a choice of bbq sauce, creamy pepper gravy, or honey mustard dressing. 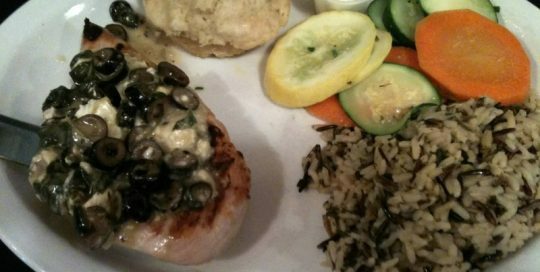 Marinated chicken breast topped with a mixture of feta cheese, black olives, sauteed spinach, fresh lemon juice, and fresh oregano. 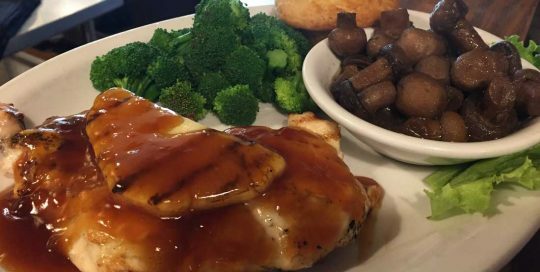 Your choice of grilled or southern fried on a bed of brown gravy. 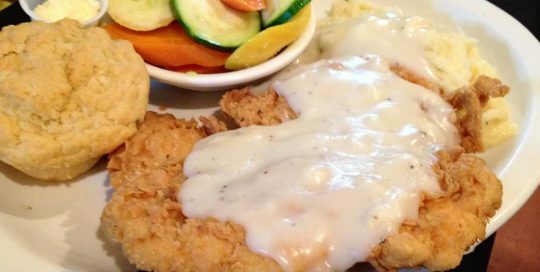 Hand-breaded beef tenderloin fried to a golden brown and served with creamy pepper gravy. 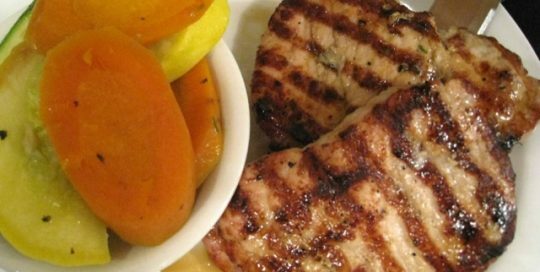 Grilled chicken breast basted with teriyaki sauce and topped with fresh pineapple. 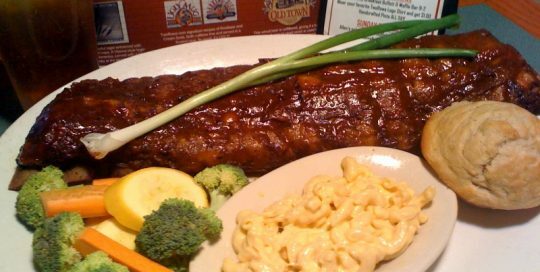 Our baby back pork ribs are slow smoked over hickory and glazed with honey BBQ sauce. 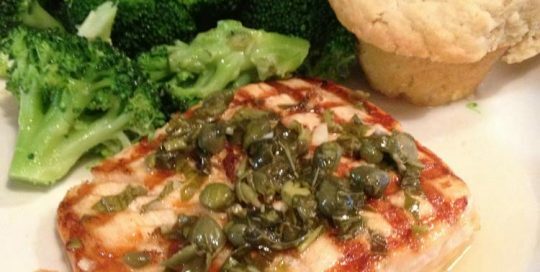 Grilled salmon topped with a lemon caper glaze. 7 oz. 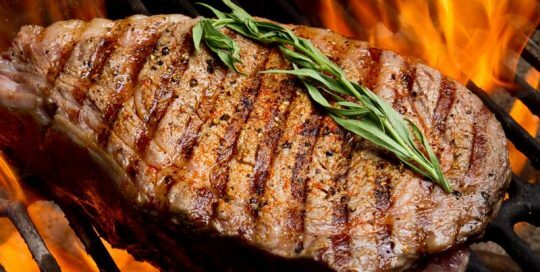 Wagyu sirloin seasoned and grilled to perfection. Wagyu cattle posess a genetic predisposition to exceptional marbling. 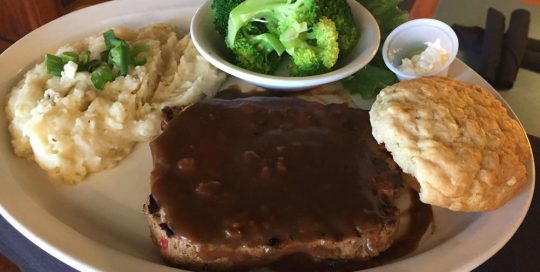 This steak comes from locally raised cattle in Melissa, Texas. 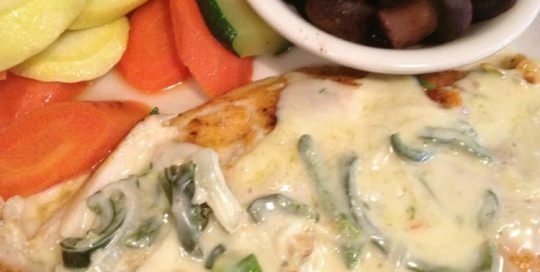 Tilapia filet lightly dusted with cajun spices, stuffed with shrimp, crawfish, green bell peppers, pepperjack cheese, and topped with a poblano cream sauce. 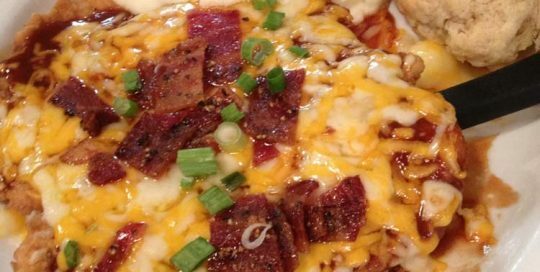 Hand breaded chicken breast deep fried and topped with BBQ sauce, monterey jack and cheddar cheeses, Honey Pepper Bacon™ crumbles and chives. 100% pure , each calf is DNA tested to ensure pure Angus. Age source verified to never have had steroids, antibiotics and hormone free. Cattle bred for tenderness and marbling from Stephenville, Texas. Specialty Entrees & Pasta	Overall rating:	4.7	out of 5 based on 338	reviews.